Russian oligarch Oleg Deripaska has admitted to having connections with the Russian mafia, the Spanish newspaper El Pais reported on Friday. The confession came during a meeting in Moscow on Wednesday between Deripaska and Spanish law enforcement representatives, who had accused the magnate last October of taking part in a scheme to launder 4 million Euros between 2001 and 2004 in two metals companies with suspected connections to the Russian mafia. At the time, Deripaska denied any such connections, and appealed to the Prosecutor General that he was prepared to answer any questions on the part of the Spanish authorities to clarify the situation. However, it became clear during the resulting five hour interrogation that this was not exactly the case. In response, Grinda told his Russian colleague, also present during the interrogation, that they would have to call the meeting off and return to Madrid if Deripaska was intent on continuing in such a rude manner. Though tempers calmed, wrote El Pais, Deripaska continued to deny his participation in the money laundering scheme. 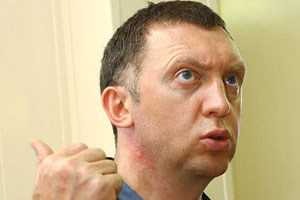 “His strategy was to portray himself as a victim of extortion by Israeli citizen Michael Cherney, who was later arrested as the of owner of Vera Metallurgica, the Alicante-based company that the Izmailova mafia organization allegedly laundered the funds through,” says the Spanish newspaper, adding that the company has alleged connections with Deripaska’s own Urals Mining and Metallurgical Company. Izmailova is one of the largest organized crime gangs in Russia. However, Deripaska did admit that he paid a certain amount of money to the mafia gang, but only in order to protect his business – not to launder any money. A source close to the oligarch’s holding company, Basic Element, confirmed to online newspaper Gazeta.ru that Deripaska had indeed given money to Cherney, but also said that in the 1990s there was no other choice if he had wished to protect his business. The admission mirrors Deripaska’s statement in 2008 concerning his alleged connections with Russian mobster Anton Malevsky. According to the Times, Deripaska “insists that the arrangement with Malevsky was a protection racket that was forced upon him.” Despite this and other allegations by American, British, and Spanish authorities, Deripaska has never been convicted of connections with the mafia. According to legal experts speaking to Gazeta.ru, it’s unlikely that he will face any consequences in this case, either, except in terms of his image. At the same time, El Pais reported that the Russian prosecutor present at the meeting had advised all parties to keep the interrogation a secret, and the paper did not reveal how it got its information. Oleg Deripaska is considered to be one of the most influential people in Russia today. His vast holdings in the metals, construction, and automobile industries have allowed him to amass a fortune of $10.7 billion, making him the 57th richest man in the world (9th before the global economic crisis). He is widely known to be a close associate of Russian Prime Minister Vladimir Putin, who signed a controversial decree earlier this year to allow Deripaska’s Baikalsk Pulp and Paper Mill to reopen despite gross environmental concerns. Residents in the city of Irkutsk, where the mill is located, have been protesting ever since, and accuse the prime minister of covering up Deripaska’s unethical business practices.